Treat the varied conditions of patients with this advanced infusion system that offers one pump for all of your diverse infusion needs. The Baxter 6301 allows you to administer fluids precisely and continuously, freeing up time to work with other patients. Its anti-tampering system means you can have the confidence that your patients are receiving the exact treatment they need and nothing else. The Baxter 6301 enables you to implement patient-specific treatments and protocols with flawless precision. • Delivers a variety of fluids over a broad range of infusion rates. • Enhanced safety through flow check occlusion alarm. • Provides flow rate calculation for errorless administration of fluids. • Front panel lock outs to protect against tampering and leave you in control. 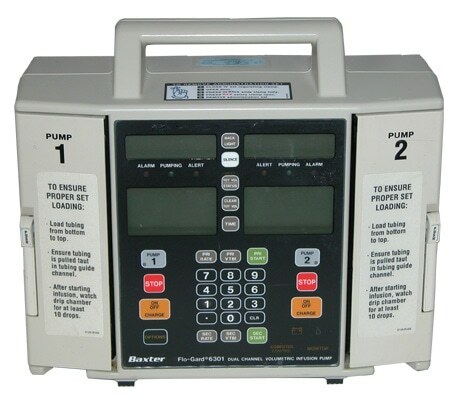 In addition, the Baxter 6301 allows for automatic restart once occlusion clears. It also automatically piggybacks secondary medications for multiple fluid infusions.